I (very) recently came across the work of Do-Ho Suh, an artist whose sculptures filled with hundreds of tiny figures pressing up and out at the world conjure up images of pressure and conformity, but also collective space and solidarity. Suh’s Korean origins are a major theme in his work – in particular he returns to the effects of compulsory military service on both an individual and a nation. A giant chain mail suit of armour that seeps out into a carpet: each link under foot is a dogtag, and all there is inside the suit is a mirror. His self portrait is a line of suits, each rigidly neat. Nostalgia for something hated, the memory of having been dehumanised, the trauma of militarisation across generations. Other works explore the existence of a foreigner, and that thorny issue of where you consider “home” to be after half a lifetime spent as an im/emigrant. 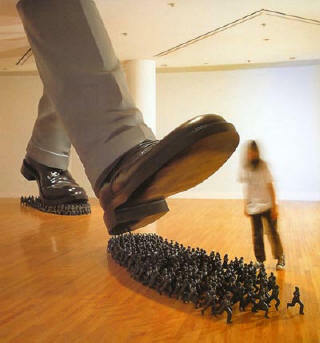 But its his works that make use of the tiny figures that have really captured my imagination. There is an obvious reference to communist propaganda iconography, but he’s doing more than shoot at that particular pop-culture fish in a, like, totally ironic barrow. The figures stand shoulder to shoulder, arms raised high, backs and legs bent under the same weight. Literally holding up the viewer in some cases; in my favourite piece holding up the plinth rather than sitting on top of it. Their faces could be expressionless – or they could be relaxed. Other sets of figures glow, gently melting into sensual pools of light. Somehow they don’t seem to imply repression so much as solidarity, warmth. Suh himself has said he sees them as expressions of the crowd, as a comment on collective and personal space. And yet… their tiny stature, the sense that they are a collective version of Atlas doomed to stand holding the world for eternity… There is no doubt these are also images of repression, of the endlessly replaceable little people who make world go round but are oh so easily trampled under foot. But is it repression through forced solidarity (collective dehumanisation), or solidarity as a means of pushing back against (resisting) repression? I can’t decide. And I think that’s really the point. I feel I can’t leave it without mentioning Antony Gormley, given that I already talked about both his “One and Other” plinth piece, and his “Fields” project which makes use of thousands of tiny blobby figures. But I’m actually finding the similarity between the two artists quiet irritating. I always appreciated Gormley’s work, but seeing Suh’s subtle, multi-layered and frankly far more interesting sculptures, I’m starting to find Gormley a little smug. Perhaps its wrong to put two artists next to each other like this. But if we do, say for the plinths, what do we get? Much as I like the idea of selecting people to “become” art on camera and be broadcast live around the world, I can’t help but love the concept of the people taking up the plinth above their heads and carrying it off. I’m really excited about Antony Gormley’s new plinth project in London. It started today, and already looks like being as wacky as only the British can be. To explain… Trafalgar Square in the centre of London has four large plinths set at its corners, three of which have some dead victorians on them. The last one was also meant to have a dead victorian, but they ran out of money and it stood empty for decades. In 1999 the Royal Society of Arts decided to commission a series of art works to be displayed on the plinth, by contemporary artists. It was such a success that it was decided to make it a permanent project. So this year, it was Antony Gormley’s turn. Marc Quinn's sculpture "Alison Lapper Pregnant"
Gormley is a British sculpture, perhaps best known in the UK for the massive “Angel of the North”. His work plays on ideas of the human condition through the human form. Usually involving casts of his own body, simplified and left in lonely places. But he also likes to incorporate involvement in the process: the “Fields” series involves thousands of tiny terracotta figures, nothing much more than blobs with eyes, that he enrols hundreds of volunteers to create. The figures are then placed in a confined space, all facing the viewer with their thousands of little eyes looking up at you. When I was an undergrad, I got a serious overdose of Gormley via Colin Renfrew, who was still teaching while I was an undergrad in archaeology. Renfrew might be famous for being an archaeologist, but he also happens to be a Lord, an ex master of Jesus College, and a wealthy patron of the arts. His house and Jesus College are covered in art works by famous and soon-to-be-famous contemporary artists and sculptures. Gormley is one of his favourites, and he and Renfrew have worked together on various projects, one of which resulted in Renfrew’s latest book “Figuring It Out: The Parallel Visions of Artists and Archaeologists”. As an undergrad it meant my European Prehistory classes involved looking at a lot of Gormley’s sculptures. We all went on a field trip to the British Museum to see Fields of the British Isles. Later that afternoon, while wandering around the European Prehistory halls, I came across a little group of Jelly Babies that someone had stood up on a table, with a little sign next to it saying “Antony Gormless”. Wonderful. Anyway, so Gormless has the fourth plinth this year, and his idea has been to open it up to the public participation. For 100 days, a different person will stand on the plinth each hour, 24 hours a day. Those who applied have been selected at random, with the only aim of making it representative of all parts of the UK. They are allowed to do anything at all in their hour, and so far after the first day it seems that there is quiet some variety. A lot of people doing things for charities, several just standing there looking about for an hour, already a protest crasher (protesting against tobacco products being shown in films), someone advertising happy hour at his pub, and a spouting politician. Last time I checked the live updater, there was a guy sitting in the rain reading a book. You can see it live here. I really wish I were back home to see it right now, and would love to hear a report from someone whose in London at the moment who can tell me how its going.